For the most part the story is set to Las Vegas, New Mexico during the post-WWI years. While he was away, Clay Forrest and Jed Lundeen have become enemies. Naturally, Virginia (Jed’s daughter) has to fall for the wounded returning soldier. If Jed Lundeen had his way, Virginia would have nothing to do with Cliff. Jed has promised Virginia to Augustine Malpass. Malpass used to be Jed’s superintendent. When we get to know Augustine he has become Jed’s partner. In fact, Malpass was the one who engineered the deal that made Jed’s fortune and ruined Clay Forrest. Cliff struggles with his extremely difficult fate. The United States was not prepared to deal with the problem of surviving veterans from the war. History has not taught us that people get wounded during wars and that somehow those who served their leaders must in turn be taken care of. Cliff was one of the victims of this thoughtlessness/callousness. No wonder finding the strength to want to fight his way back to some kind of health seemed impossible. Zane Grey always offers the heroes/heroines of his stories a way to handle the challenges he throws their way. Both Virginia and Cliff discover extremely unpleasant truths about their fathers. Rather than taking the sides of their parents, the two end up working to become stronger (in Cliff’s case) and reveal the truth about old dealings (in Virginia’s case). 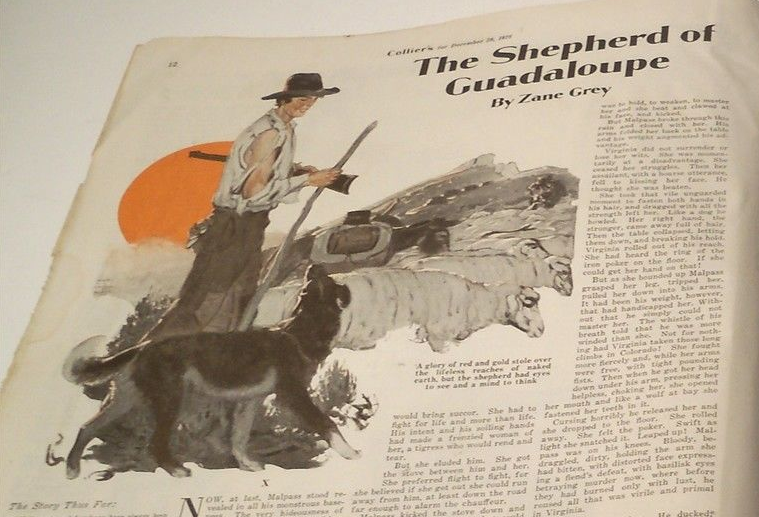 Cliff goes off to be a Shepherd, hence the title of the novel. Through the work, his closeness to nature and revelations about the fates of people around him, Cliff begins putting himself together again. Virginia goes off to Colorado to stay with her friend Ethel and discovers strange things about her father’s silver mine and the role of Malpass in Jed’s dealings. “Thick as thieves” certainly does not relate to our partners in crime.